It gives me immense pleasure to say that I'm posting the 50th post in the Monday Moments series. It's been quite a journey. I remember moments when I couldn't think of anything. And the moments when I just had too much to elaborate. I cannot be happier about this blog series. Thank you, readers for your great support and love! Here's a post dedicated to all the women! 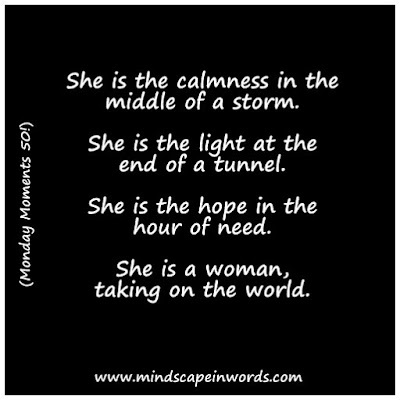 She is the calmness in the middle of a storm. She is the light at the end of a tunnel. 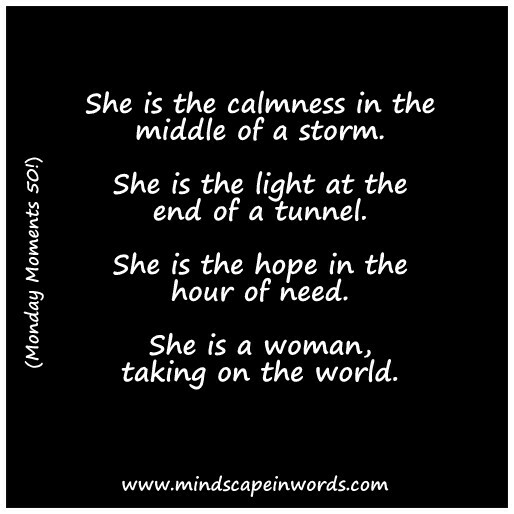 She is the hope in the hour of need. She is a woman, holding everyone up and taking them ahead with her. Looking like her mother but taken after her father, she was born to create wonders. She was the one who didn't care what society thought. She was the one who cared only for those who cared for her. Not once did she let her family down. She was her parents' support system. She was their daughter, a brave soldier in the battlefield. She wasn't only his girlfriend. She wasn't the one who would wait for his message. She knew that she was okay with him and she knew she would be okay without him. She only needed herself to create her own life and all its magic. She loved him with all her heart. But, she was smart enough to love herself more. She was her own boss. She made a living from her passion. She was a working woman with an innovative mind and a powerful personality. She was the company's bright future. She was the kind of friend who listened. She knew better than to share every detail of every day of her life to her friends. She listened carefully about their lives, passions, love interests and problems. She would be most practical but also kindly empathetic to her friends. She was their shoulder to lean on. No matter what happened to her, she always stood up and kept walking. She was a woman taking on the world. She is the one who makes every moment amazing. Nice one aishu, I read your blog after a long time. Congrats for completing 50. Really enjoy reading poems/short stories like this. Beautifully written! What an awesome story! Such a great piece. 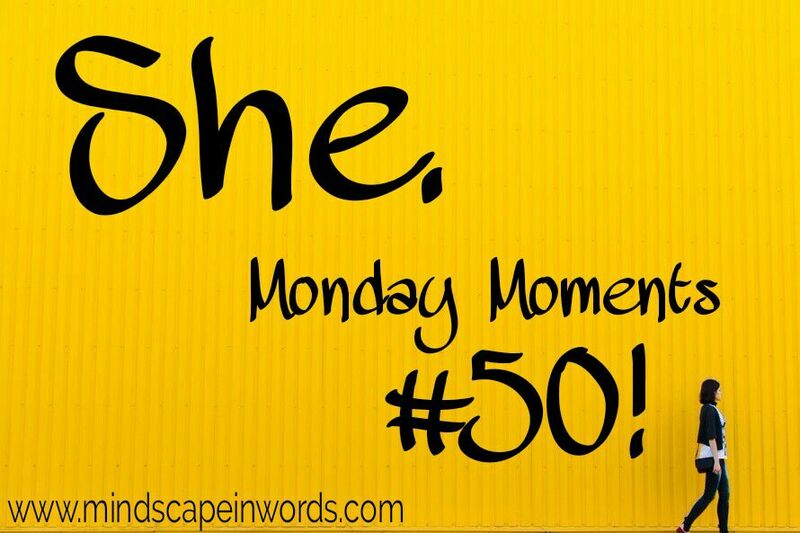 Beautiful post to celebrate your #50 in the series! Congrats Aishwarya, you are presenting some wonderful information/thought provoking content through the series. Congrats on 50 posts!!!! I love your writing - please continue! So lovely- you have magic with your words! Powerful post on women empowerment!